In the bottle Tom Ford Nail Polish Black Out looks like a metallic black with silver shimmer but if you look under light, you can see it flashes in many colors, which gives Black Out its complexity and extra dimension. The base shade is a very deep black with a slight hint of blue but I might be imagining the blue because of all the different shimmer blurring my mind. The shimmer of Tom Ford Black Out is not hidden nor it is too obvious. It has the great balance between looking too black and looking shimmery. With one coat it is almost fully opaque. The following swatches are taken with two coats which I prefer. The consistency is exactly right, it applies like a dream. I am wearing it for the fourth day now and it is going strong, without tip wear on the left hand and minor tip wear on the right. I pulled out some similar shades from my stash to compare to Tom Ford Black Out. You can see how crazy I am about shimmery blacks. Chanel Steel is more metallic, less shimmery. Chanel Cosmic (reviewed here) is close in terms of the subtlety of shimmer but the shimmer particles are less and a little bigger in Cosmic. On the nails Black Out appears more complex compared to Cosmic. Diorific Diva is close in terms of shimmer but it leans warmer because the shimmer particles are more golden. Dior #905 Black Sequins has more shimmer and they are mostly silver. 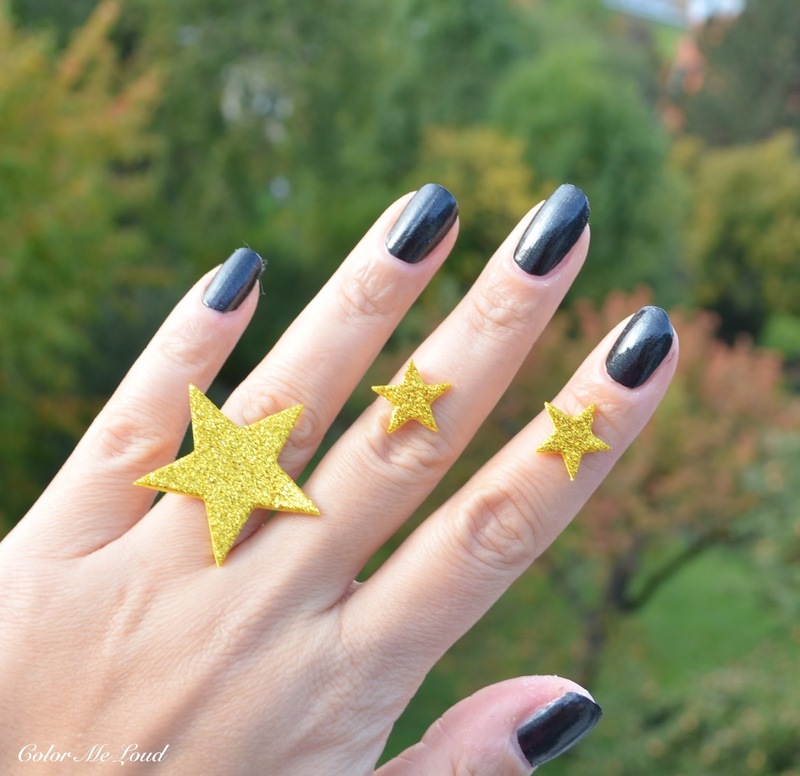 YSL Nuit Noire has more chunky glitter (never loved that one, reviewed here). Illamasque Creator is also more of a glitter base combination which dries down in a textured way. D&G Stromboli has bigger shimmer/glitter particles, it is not textured but very different than the subtle finish of Tom Ford Black Out, the shimmer in that one is gold. 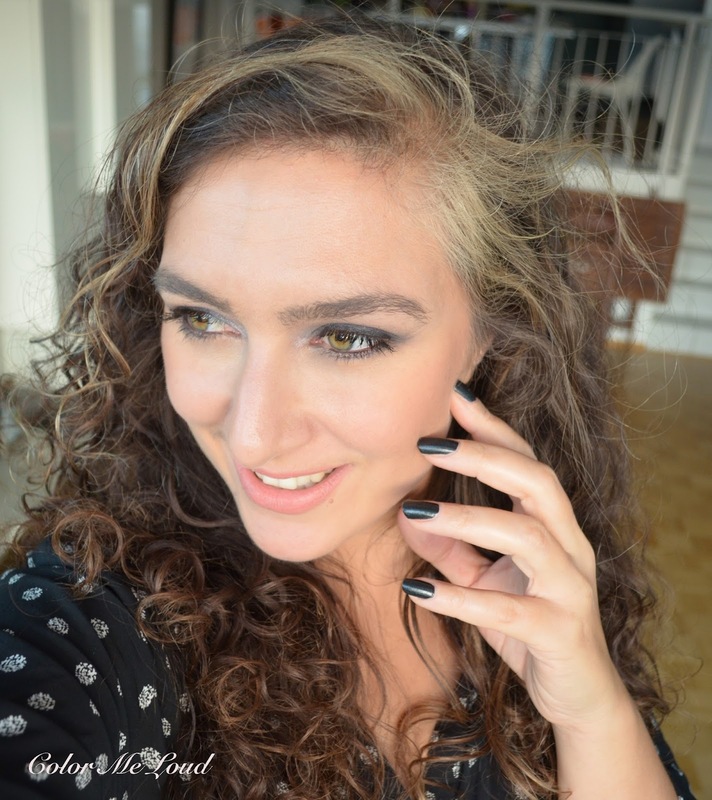 Here is a sneak peek FOTD with Tom Ford Black Out and other items from Noir Collection which I am loving at the moment. As a spoiler: Eye Duo in Night Sky is very wearable and to die for. Review is coming up soon. I am wearing Tom Ford Matte Lip Color in First Time (reviewed here) on my lips which comes back with special packaging with Noir Collection. Blouse I am wearing is from More & More. Final thoughts: Nothing but love for Tom Ford Nail Lacquer Black Out, it is wearable, easily removable (no chunky glitter) and has a complex gorgeous shimmer. Its consistency is great and it is almost opaque in one coat. 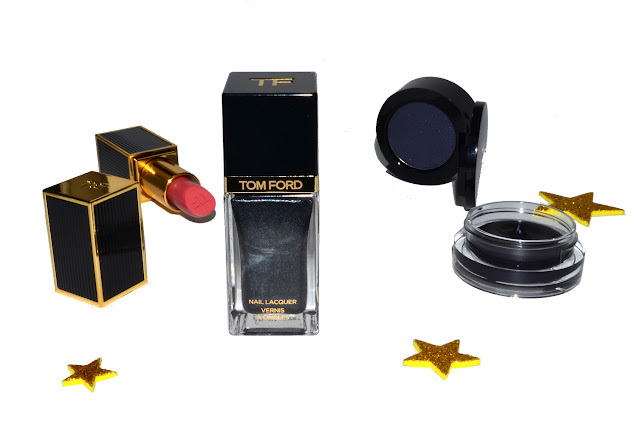 Availability/Price: Tom Ford Noir Collection for Holiday 2015 is going to be out in November. Tom Ford Nail Lacquer Black Out is limited and costs around 37€. Are you eyeing any nail polishes for the Holiday season? What is your favorite nail polish shade for Holidays? i'm with you Sara! i cannot resist black polishes!!!!! i love when cosmetics brands come up with different ways to create black(ened) nail polishes!! i can't wait for your review on Night Sky Eye Duo!! OMG! Der Nagellack ist sooooo schön! ich muss den haben! It looks very close to Steel - I did not expect that. PS - it looks really good on your hands. Agreed -- looking forward to that one too! My favorite line in this review is "All in all I don't have a dupe of Tom Ford Black Out in my collection but it depends how you define dupe. *chuckles*" As I tell myself -- that the TF formula makes it different. And I am definitely seeing a hint of blue. My hubby looks at my khaki olive shadow collection and says they all look the same, but I look at them, and I see a thousand different shades and variations. Do you feel the same about your black polish collection? I'm very curious to read your review of the eye duo...it looks so gorgeous but I'm not convinced I could pull it off, as it looks very dramatic in the promo photos I've seen. I really like the look you did here; it goes really well with your blouse! Oh I LOVE this one!! Can't wait to try it out for myself too!! The last black shimmery nail polish I tried (YSL Nuit) was just impossible to remove, such a pain! And I am in awe of the multi-colored shimmers. Hope you're managing to catch some rest! Yowza! Your shimmery black nail polish collection is truly impressive! TF Black Out is gorgeous, but I was instantly drawn into Chanel Inframental! I get good longevity from TF polish. This color is a stunner. Tempting. So tempting! 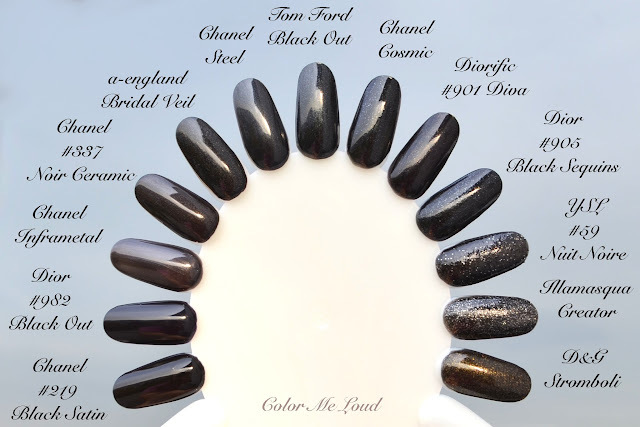 I really love Black Out, very chic and still special. I think you should pull the trigger on that one. ja dir würde ihn sehr gefallen. Es muss in ein/zwei Woche schon erhältlich sein. this one is definitely different than Steel. Steel has more of a metallic sheen but Black Out has more defined sheen. They are close though, you are right. I like black polish with a hint of shimmer and can't get enough of these (you see how many I collected over the years). I am crying over the fact that I couldn't catch Chanel's Night Sky though :-((( Do you have that one? Hahaha Alison, yes I know, many would say "you have 12 dupes in your collection" and I say "I have none". There is a hint of blue in that one and also it flashes different colors, like pinks, blue etc. I swear I am not making it of lol. Inframetal was in a set with a lipstick. To date I still wonder how the lipstick was looking like. Too bad I had to hunt it on eBay years later than its release. The same here! I am not so much into shimmer glitter but on black it looks so classy! Hi Linda, YSL Nuit was a big failure really, ugh. I am happy that this one is much better and it can be removed very easily. Hi Jess, I posted about the eye duo as well, loving it right now. It can be sheered out but no matter how much you sheer it out, it is still very dramatic, so probably you might want to wait for the Spring Collection, maybe there is something in there for you. I know right, we all have shades which we collect and see the tiny bit of difference between the two whereas everyone else would call them dupes! The only problem is that I feel like that not only for blacks but for purples, pinks, taupes etc. etc. I think I need a therapy hahaha. So right... I was just thinking to myself over the weekend that YSL glitters are just.... atrocious. I actually found a near dupe of this polish in my collection. I know you may not consider it a near dupe but here it is: http://1.bp.blogspot.com/--nrMwviiesg/UlmiLM4KNhI/AAAAAAAAqw0/b0jJDKmqcQs/s1600/Elevation+Polish+Black+Ice+5.jpg Actually a matte but of course, you can always top coat it. I'm missing Night Sky too - missed it on an EvilBay auction not so long ago too!! Still no Tom Ford Holiday here.